I am nuts for nuts! 🙂 Although my palate doesn’t discriminate, my favorite type of nut is one those that I grew up eating lots of: cashew nuts, native to Northeastern Brazil. While they can be used in a range of recipes or consumed by themselves raw or roasted, Glazed Cashew Nuts (or Castanha de Caju Glaceada) is by far my preferred way to devour cashew nuts. The curious thing is, cashew nut is NOT A NUT. Huh? That’s right! It is marketed as a nut, but is actually a seed, attached to its meaty, sweet, astringent fruit as you can see below. The fruit, cashew apple (caju in Portuguese), makes great compotes (my mother’s is the best! ), juice, alcoholic (e.g. caipicaju) and non-alcoholic drinks (cajuína), ice cream, vegetarian stews such as the Bahian moqueca de caju, and other dishes. Both cashew fruit and cashew “nuts” are very popular in Brazil– much of the world has never experienced the fruit, however, and only seems to be aware of the cashew “nuts”. Did you know that the World’s largest cashew tree is in Northeastern Brazil? 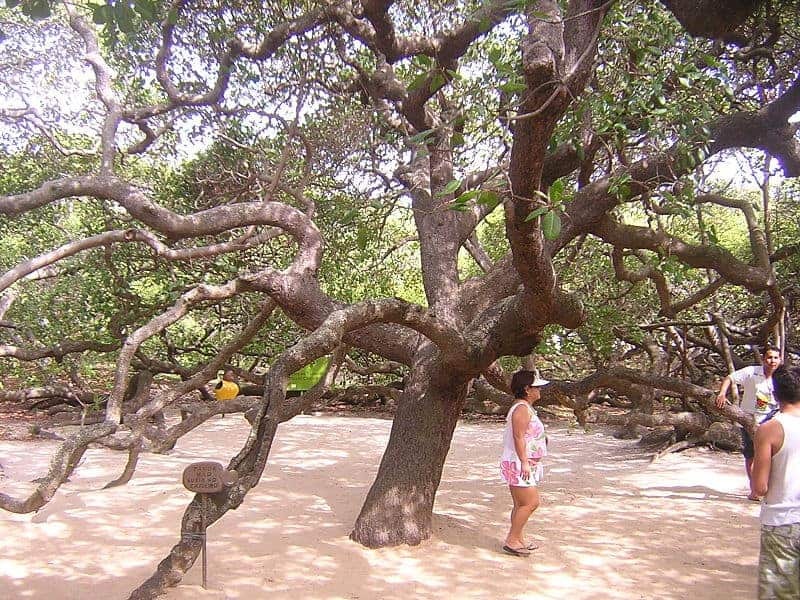 It is named Cajueiro de Pirangi (Pirangi’s Cashew Tree), located in the state of Rio Grande do Norte. According to the Guinness Book of Records, it covers an area between 7,300 square meters (1.8 acres) and 8,400 square meters (2.1 acres). This is the size equivalent to 70 normally sized cashew trees!!! As always, I modified Veronica’s recipe a bit so I could call it my own. I substituted orange juice for water, as well as a mix of ground cinnamon and nutmeg for pumpkin pie spice. You are welcome to try either recipe, or to put in your own personal touch(es) as well. What’s your favorite cashew nut recipe? 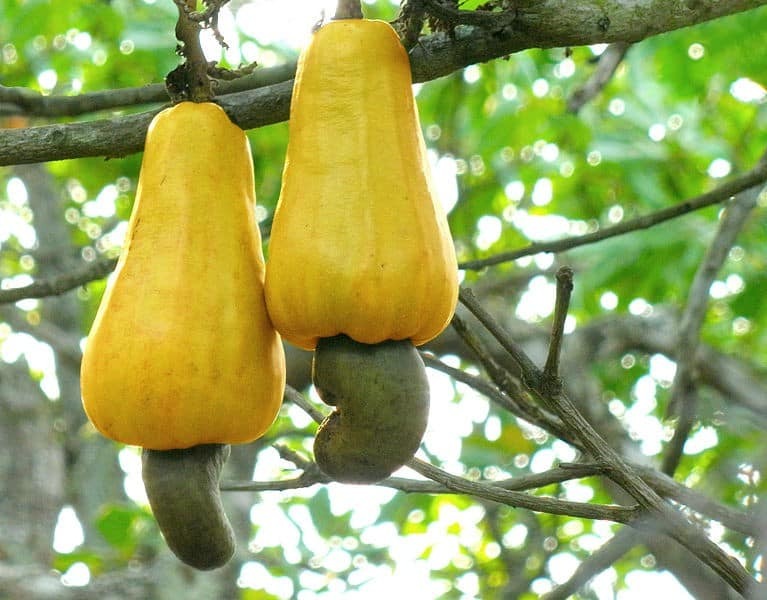 Did you know about the existence of cashew fruit? Aromatic, sinfully tasty Glazed Cashew Nuts that can be served by themselves or accompanied by an ice-cold beer, guaraná soda, or other drink of your choice. Preheat oven to 325 degrees F (163 degrees C). Line 2 large baking sheets with parchment paper and set aside. Beat egg white until foamy. Stir in both the salt and orange juice. Combine sugar and spices together in a small bowl. Stir in into the egg white mixture until obtaining a paste. Stir in cashew nuts enough to coat. 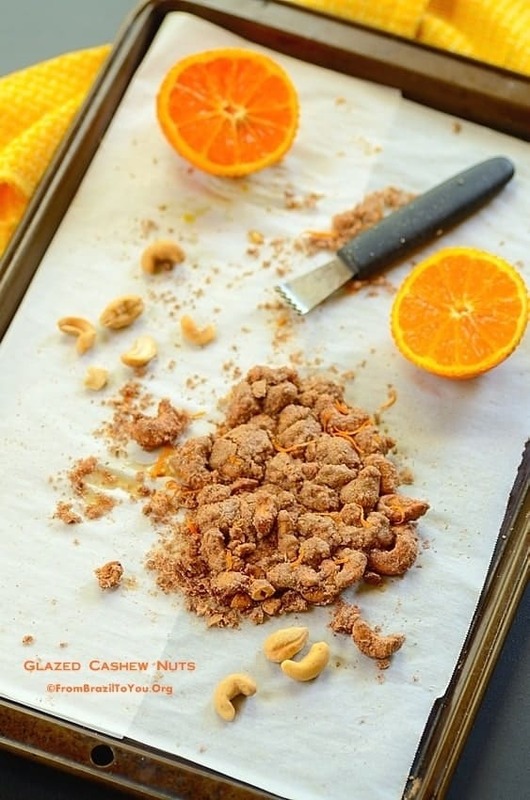 Lay cashews evenly onto the 2 lined baking sheets, in one single layer on each sheet. 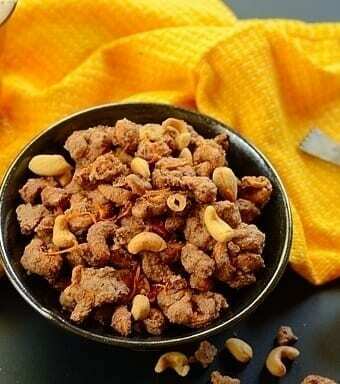 Bake cashews for 21 to 23 minutes, stirring once or twice for even baking. Remove from the oven and sprinkle orange zest on top while still hot. Enjoy! 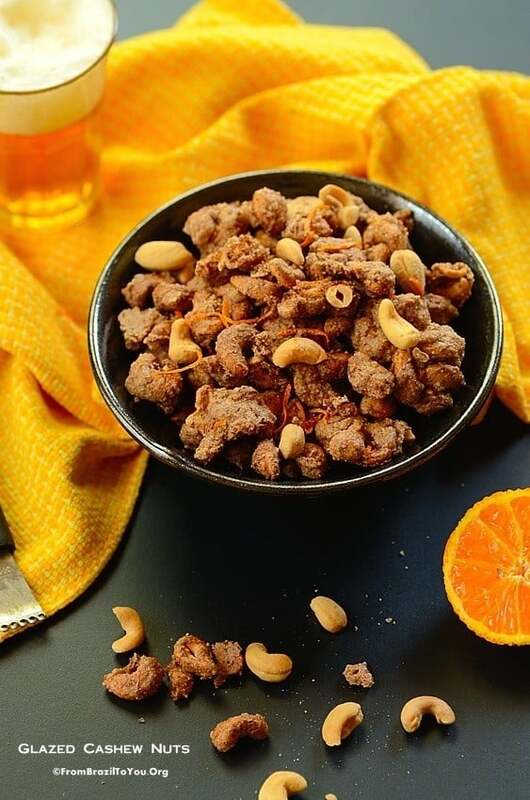 Glazed Cashew Nuts make a great snack (tira-gosto) all by themselves, or can be accompanied by an ice-cold beer, guaraná soda, or other drink of your choice. 1. Ripe cashew apples by Abhishek Jacob from Wikimedia Commons, 2. World’s largest cashew tree by Wolfhardt from Wikimedia Commons. Wow! I love how you took my recipe and modified it. I had not idea that Cashews were not a nut. I do love them though. I will have to try your take on this recipe. Thanks, Veronica! You did a great job with your crack cashews, from this was adapted. Wishing you a wonderful week and thanks for stopping by! Thank you, Sally! I hope you had uma Boa Páscoa as well. Glazed nuts in general are becoming more and more popular in Brazil, which are available both on the streets and in kiosks at the malls. The blend of spices varies from a place to the other although cinnamon and nutmeg are the most popular. Have a great week, my dear! Now there are two Veronica’s in the club again – I’m the other one, from Veronica’s Cornucopia. 🙂 These sound soooo good and I love that you used orange juice instead of water – good call. I’m a nut lover too and cashews are my favorite as well! I did know of the cashew fruit but didn’t know anything about it other than the seeds/nuts were taken from them. I didn’t know if you could eat it! I hope I have the chance some day. Hi, Veronica! I hope you can try the fruit one day. It used to be my Grandma’s favorite. I do love both its juice and compote. Thanks so much for stopping by. I always learn so much from you Denise! I had no idea cashew weren’t nuts, so interesting!! These look wonderful and I can see how they could be extremely addicting! Pinned!! Thanks a lot for sharing this recipe, Chris! I do hope you have the chance to try the cashew fruit one day. Not a nut? Who knew! Not or not, they’re my favorites…and I could eat a bucketful of your glazed cashews!!! Me too, Chris! I do love cashews in many ways and dishes. Thanks for visiting FBTY! I had no idea a cashew wasn’t actually a “nut”! What an informative and scrumptious post! I like to make cashew butter and use it just like peanut butter. 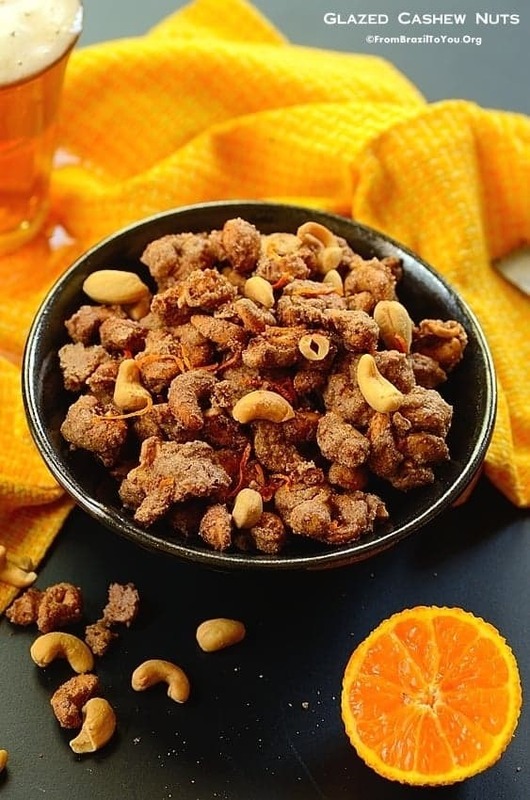 Cashews in granola is sublime! I agree with you, Deb! Cashews are great both in granola and to make cashew butter. 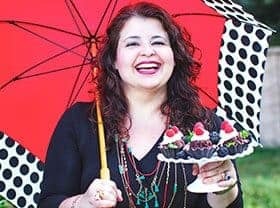 Denise, I remember seeing those huge cashew trees when visiting Brasil…these cashews coated with cinnamon and nutmeg and orange just look delicious…these are the ones that you cannot stop eating. I’ve never eaten on the fruit. We love cashews in my home so so much specially the salted one. So it is time to try your version very nice and healthy snack. I know my taste buds will thank me for those. I wish I could send you a basket full of cashew fruit, Amira! I hope you try this sweet version. If you do enjoy bold flavors, this is the fruit for you then, Raymund! The pleasure is mine, Shashi! Likewise. I love cashews and I had now idea how they were grown. Thanks for the info and a great recipe! Cashews are my favorite nut. I can imagine how great they are glazed. This thing is addictive, Margaret! Nuts of any kind are addicting even if they are seeds! Love glazed ones, even more! Thanks, Abbe! These are addictive indeed. I always forget that cashews aren’t really nuts. But they seem like one, so that’s how I like to thing of them! Same way I never think of tomatoes as being a fruit — just seems wrong. Anyway, love this recipe! Such good stuff — thanks. This happens to be the nut I have grown up eating too. But I didn’t have all this information. 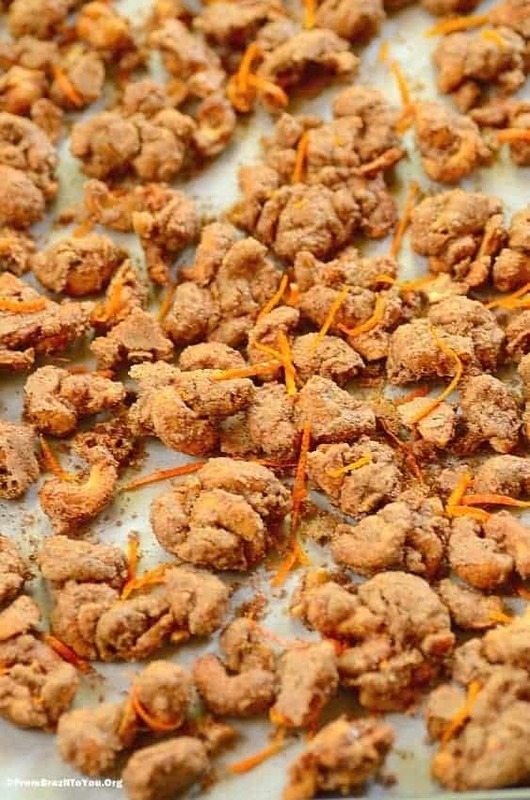 I love your twist in the recipe and all the zested orange around the glazed cashews. This is a gorgeous way of eating nuts. Sorry my friend, I have been a bit slow on the blogging front. It has been crazy hectic on my side with my in-laws leaving this weekend. I hope to return to my usual schedule shortly. Hi Denise, I have no idea why but I have stopped getting updates from your blog… Hmm I am still following you though! Cashews are my fav too and I do end up having the store-brought roasted cashews for my tea at least once a week. I have an uncle who was into cashew farming in Kerala, India. So lots of fond memories attached this nut! Love your glazed version. I had once made Giada’s glazed mixed nuts and loved it! Hi, Rekha! I have no idea why you are not receiving my blog updates. I am so sorry for it! Have you verified your spam or junk folder? Have you changed your email address? Have you unsubscribed or is your main folder full? These are issues that can cause problems. It seems that others are receiving my updates so I cannot figure this out. Thanks a lot for stopping by! I do appreciate it. Yes, India produces cashews as well. I do hope you try this recipe. It is really good! Something interesting; in Urdu and Hindi, the name for cashew is kaju same as the Portuguese! I grew up eating cashews and they are widely used in Indian cooking. I was always fascinated by the cashew tree, love how they grow! I also love glazed nuts of any kind and these look soooooo good! Thanks, Nazneen! I know that India produces a lot of cashews. Portuguese brought them from Brazil to Goa, in India. Since then, cashew is present in the wonderful Indian cuisine. Have a great weekend, my friend! wow! we love cashews! didnt know its actually a seed! Thank you, my dear! I always take a peek on your gorgeous photos on the FP group on Facebook. You are a great photographer. I want to face plant into a big ol bowl right now.